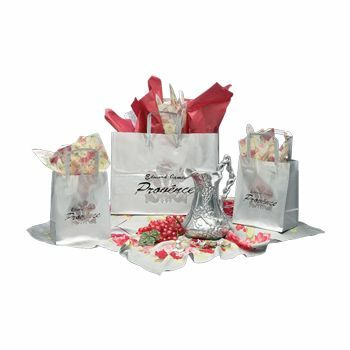 These frosted clear Euro totes offer just enough transparency to make them enticing to your customers. A white macrame handle makes carrying items easy. 6 X 3 X 7"
19 X 6 X 16"
Frosted Clear Euro Totes are a stylish way to package your customer's purchases or to wrap up gifts and giveaways. These bags are outfitted with grommets that hold a white macrame handle for ease of carrying. A cardboard bottom adds stability to the bag. Select any color of ink for printing of your company's image or logo. On-time production of your order is guaranteed, and rush shipping is available.